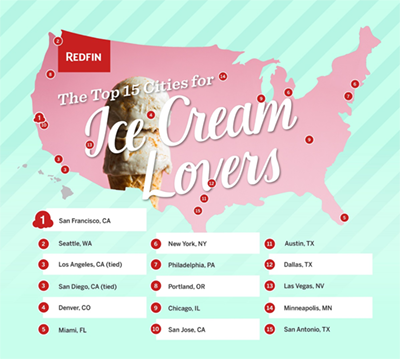 San Francisco rated #1 when Redfin researched which cities have the best ingredients to satisfy ice creamlovers across America. Mitchell’s Ice Cream was rated first in the list of sixmentioned by Redfin for San Francisco. In all there are 61 ice cream shops in San Francisco,making this a great honor for Mitchell’s! Be sure to stop by to sample our special holiday flavors or to pick up gift cards for family members and friends. Envisioning the process of creating delicious frozen ice cream treats may bring to mind visions of Willy Wonka’s Chocolate Factory. 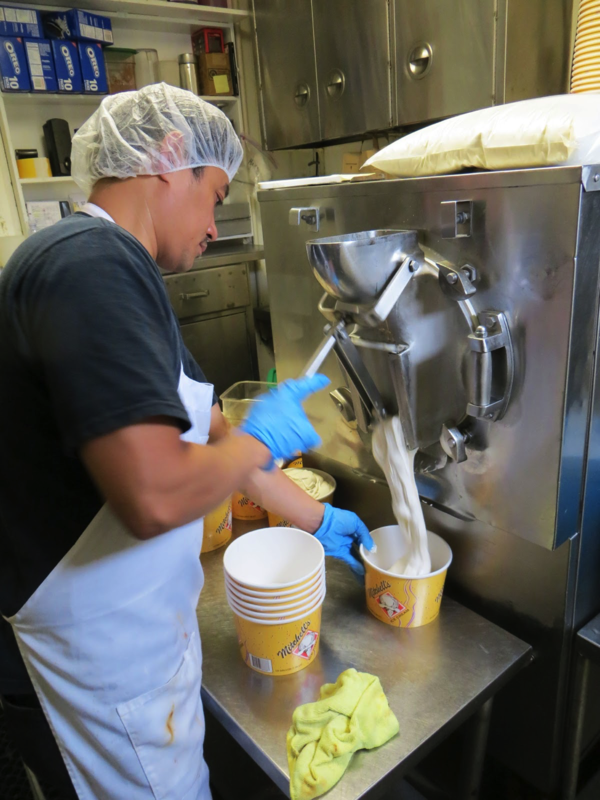 While making ice cream is a passion for our family, the process takes a lot of hard work. The magic happens in a 40 quart Emery Thompson Freezer. We make about 550 gallons of ice cream each day throughout the warmer months (a little less in the winter). Our ice cream makers start bright and early every morning at 3 a.m. They work in teams of two and make about 15 to 20 flavors through the day, always starting with our very popular Madagascar Bourbon Vanilla. The process starts by pouring five gallons of cream into the barrel of the freezer. 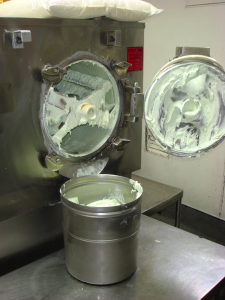 The blades of the freezer rotate around inside the barrel, scraping the cream off the sides as it freezes. Fruit, nuts, chocolate chips and other ingredients are added to the machine at just the right time to ensure a smooth and creamy texture. Once the cream reaches the proper consistency, the gate on the front of the freezer is opened and ice cream containers are filled. It takes about 10 or 11 minutes to create each batch of ice cream. The soft, freshly made ice cream is then transferred to a walk-in freezer to harden for 24 hours before it is served. While making ice cream sounds like a lot of fun, it requires a lot of hard work. Our ice cream makers must be focused and able to lift heavy containers of ingredients. It takes good preparation and experience to make our super-premium ice cream. The ingredients for each flavor must be carefully cooked, blended, chopped, and measured so that the perfect mixture is created. Additionally, if the process is not timed correctly, the final product could be icy or crumbly. While ice cream making is not always easy, seeing the happiness on our customers’ faces when they enjoy their favorite flavors is worth all the extra work and effort. At Mitchell’s Ice Cream, that’s the way it’s been since 1953. Our goal today is the same as it was when we first started – to create the best ice cream in San Francisco. Stop by and visit us today! More than "16,000 Likes" & growing! 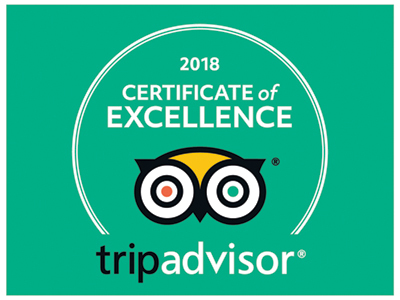 Over 3,700 Yelpers give Mitchell’s a 4.5 rating and they’ve posted more than 2,300 photos of Mitchell’s ice cream on Yelp. See for yourself. We're Closed Christmas Day, Thanksgiving and New Years Day. Visit our store in the Mission District, or purchase Mitchell’s Ice Cream from select Shops and Grocery Stores. Visit our Online Store to order ice cream cakes, apparel and gift cards. 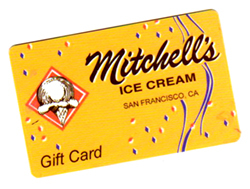 © 2005-2019 Mitchell's Ice Cream, Inc.
Our gift cards make great gifts for friends and family members who love Mitchell’s Ice Cream! Purchase them in any amount. Visit our online store to see other products, too! Here’s what our customers, food critics and travel guides say about Mitchell's Ice Cream.